Create summer time treats using juice, yogurt, gelatin, fruit, ice cream or pudding. 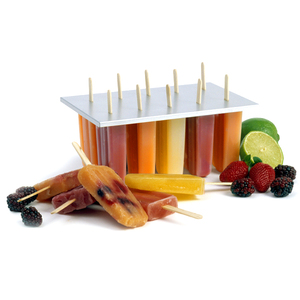 Makes 10-3oz Ice Pops, each measuring 3.5" x 2" x 1"/9cm x 5cm x 2.5cm. Made of BPA free durable plastic with aluminum top. Includes 24 wooden treat sticks. Hand washing recommended.